Music From Japan opened the New York City portion of its Festival 2009 on March 7 at Merkin Concert Hall with another installment in the Masters of Tradition series. 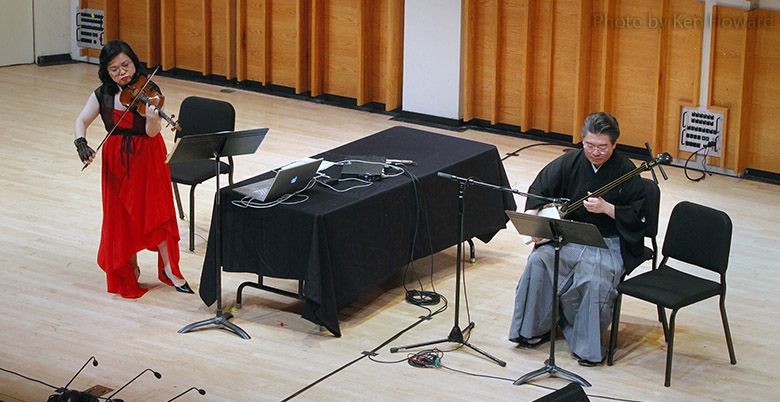 This year’s program, Masters of Tradition: Mojibei Tokiwazu V and his shamisen quartet, featured both traditional and contemporary compositions for the shamisen, a three-stringed, banjo-like instrument. We were very grateful to have Mojibei Tokiwazu V, fifth in a line of distinguished shamisen players, perform with the other members of his quartet: Ichiro Takabatake on jiuta shamisen, Taku Taguchi-Touon on hosozao shamisen, and Sansuzu Tsuruzawa on futozao shamisen. Before the performance, Mr. Tokiwazu gave an insightful lecture in which he traced the origins of the shamisen to the Middle East and followed its development across Asia to Japan. He then detailed the history of the Tokiwazu style of shamisen playing and its association with Kabuki theatre, with demonstrations on the instrument. The concert portion of the evening’s program began with Mr. Tokiwazu performing Noriaibune Ehou Manzai (1843), a traditional work for shamisen and voice. The theatrical elements of the Tokiwazu style shone through as he evoked a variety of street characters from the original dance. Next on the program was Sue no Chigiri, another traditional work for shamisen and voice, performed by Ichiro Takabatake. Couched in a surge of allusion, wordplay, and vivid imagery, Sue no Chigiri is a love song full of longing and hope. Mr. Takabatake’s poignant performance beautifully conveyed the essence of the story. Closing the first half of the program were selections from Etudes for shamisen duo, composed by Mr. Tokiwazu’s father, Eiju Tokiwazu (Mojibei Tokiwazu IV), in 1962. Despite its name, the work demanded a high degree of virtuosity from its performers, a challenge Mr. Tokiwazu and Mr. Taguchi-Touon were more than capable of meeting. The second half of the program featured three contemporary works for the full shamisen quartet, two by Mr. Tokiwazu and the third a new Music From Japan commission by Kumiko Omura. Ms. Omura’s work, Dance of Spirits, stems from her earliest childhood recollections of festivals and of dancing the Bonodori, a dance associated with the Buddhist observance of Urabon – a memorial to pray for the spirits of family members who have passed on. In this piece, she evokes the journey through darkness to light as the souls of the dead are saved. Sparse and mysterious at the opening, Dance of Spirits grew little by little into a boisterous and joyous work invoking the festivals and dances that had inspired it. Mr. Tokiwazu’s offerings – Shamisen Quartet No. 3, “Fête” (2004) and Shamisen Quartet No. 5 (2008) – each maintained strong ties to the tradition while expanding on the vocabulary of the shamisen. Through altered tunings and new rhythmic techniques, the works explored new realms of timbre and motion while preserving their compelling nature. After the performance, Tomodachi and supporters of Music From Japan were treated to a champagne reception with the performers and other VIPs, as well as the composers from the Tradition/E-novation program. 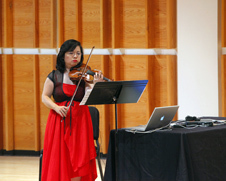 The festival continued on Sunday, March 8 with Tradition/ E-novation, a program curated by Mari Kimura, who is as well known for her virtuosic violin playing as for her innovations in the field of interactive performance. The program featured compositions for shamisen, violin, and voice by Ms. Kimura and Tomomi Adachi, both of whom performed, as well as by Mari Takano and Takayuki Rai. 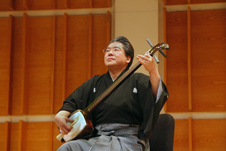 Mojibei Tokiwazu V lent his formidable shamisen skills to the performances. Mr. Tokiwazu opened the program with Tsumoru Koi Yuki no Sekinoto (1784), a staple of the great Tokiwazu repertoire, and expertly performed and narrated this complex tale of love, politics, and human ambition. 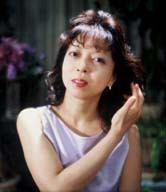 Mari Kimura followed with her Subharmonic Partita (2004). One of the many contributions for which Ms. Kimura is recognized is her development of the violin technique known as subharmonics, by which it is possible to play notes below the normal range of the instrument. Using key motives from Bach’s Partita in E-major as the basis for her work, Ms. Kimura took the audience on a whirlwind journey of virtuosity. Next, Ms. Kimura performed Takayuki Rai’s Active Figuration, a new Music From Japan commission for violin and computer. Mr. Rai’s composition was remarkable in its elegance. 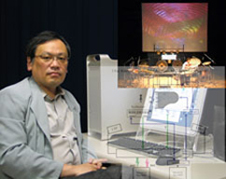 Using real-time sampling and analysis technology, the computer generated an impressionistic accompaniment and counterpoint to Ms. Kimura’s violin. The first half of the program closed with Tomomi Adachi’s epic Odorimbisha, another Music From Japan commission, for shamisen, voices, and live electronics. Mr. Adachi’s work is heavily influenced by both sound poetry and the American Experimentalist tradition, which this piece reflected. Featuring Mr. Tokiwazu and the composer himself, Odorimbisha layered multiple traditions and cultural histories in a fashion at once mystifying and captivating. Moving rapidly between somber and comic modes, the artists gave a highly engaging performance. The second half of the program featured two more world premieres of new Music From Japan commissions. For Mari Takano’s Full Moon, Mari Kimura performed with an electronic accompaniment consisting of a variety of sound sources, ranging from the purely electronic to samples of her own playing. Ms. Kimura’s Pluck Land for violin, shamisen, and interactive computer closed Sunday’s program. Centered around the theme of plucked instruments (including both violin and shamisen), the work also showcased the Augmented Violin System, a glove developed by IRCAM and modified by Ms. Kimura that tracks the movements of the violinist’s bowing hand to send control data to a computer, which can then be mapped by the performer to change the sounds. 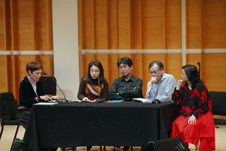 After the concert, Sharon Nakazato moderated and translated a question and answer session with this year’s commissioned composers. To begin with, each composer explained his or her process and inspiration for composing. The conversation soon turned to the influence of Western music and how each composer balanced Japanese musical tradition and Western influence in their own work.